Some time ago, 9jafoodie shared a recipe she prepared: Asun, served in cute Plantain Calabash. I made up my mind there and then that I must make those or something like it. 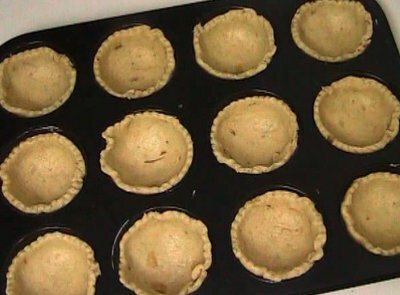 And Plantain Pies were born. 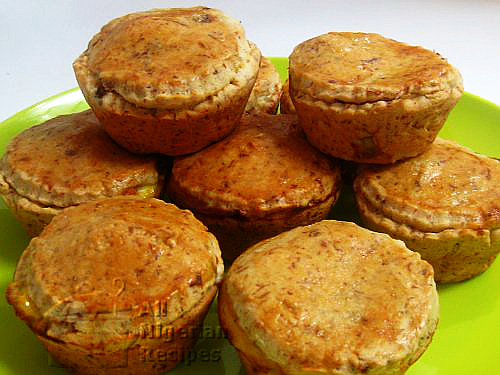 Any food item that goes well with plantains (especially fried plantains) will make a great filling for Plantain Pies. 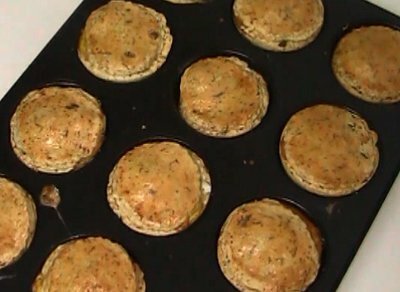 That is why I called them Plantain Pies and not Yam Pies. So feel free to use beans porridge, egg omelette etc as your filling. Baking powder is optional because I made this pie with and without baking powder, I did not notice any difference in the taste and texture. Set some butter aside for greasing the muffin tray cups. Peel and cook the yam till well done then set aside to cool down completely. Cut the onions and red pepper into small pieces. When the yam has cooled down, cut into small cubes. Peel the over ripe plantain and mash with a fork. Set aside. Sift half of the flour, the salt and the baking powder into a clean dry bowl. Cut the butter into small pieces. Add them to the flour and mix till the butter is incorporated into the flour. Add the mashed plantain. 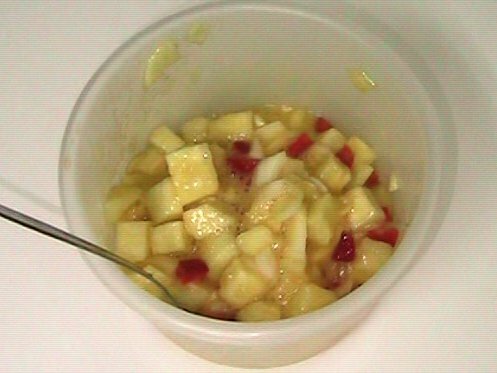 Mix with a spatula till as smooth as possible. You will notice that it is quite sticky. 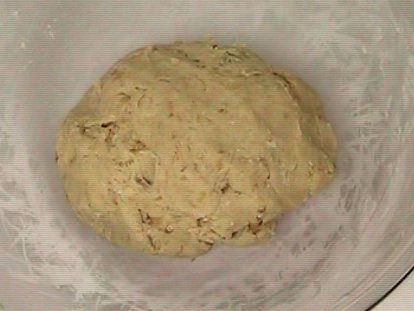 Start adding the second half of the flour in small quantities, mix with the plantain and flour dough, add more, mix ... till you get a non-sticky but soft ball of dough. If you do not achieve this with the quantity of flour I stated, add more flour till you get that. Ideally the quantity of flour you'll need depends on how overripe your plantain is. When you are happy, cover the ball of dough with aluminium foil and leave to rest for about 10 minutes. Break the eggs and beat very well. Add the pieces of boiled yam, red pepper and onions. Stir very well and set aside. It should look like this. Grease the insides of the muffin tray cups with butter. When the dough has rested for about 10 minutes, knead it a few more times. Roll it out on a flat surface to a 3mm thickness. Cut the rolled out dough with the 3.75-inch cookie cutter and use the cut out dough to line the cups in the muffin tray. You can make several cuts at a time. Repeat the process till you have lined the 12 cups of the muffin tray. Scoop the filling into each of the cups. Leave some egg in the bowl; you'll need it for glazing the pies. 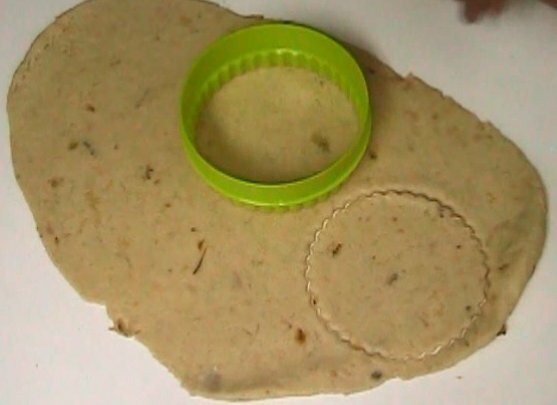 Roll out the remaining dough and cut with the 3-inch cookie cutter. Use these to cover each of the filled cups. 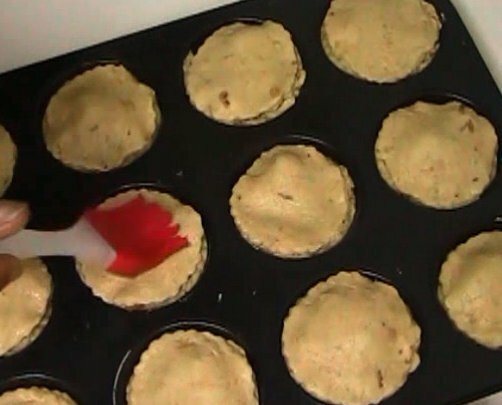 Using a brush, rub the top of the pies with the leftover egg from the filling. This gives the pie a golden brown look when done. Serve with a chilled drink. 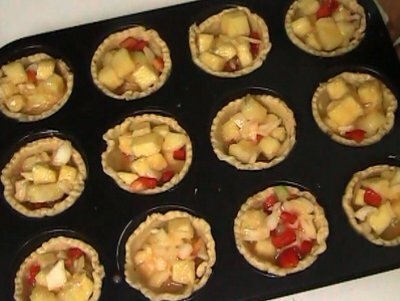 These pies preserve well in the freezer and will still be fresh for up to 1 month. To use, bring out from the freezer, leave to defrost on your kitchen counter for a few hours. Warm it up in the microwave oven for about 2 minutes at medium heat. Perfect!